Our practice is growing by leaps and bounds! We are looking for compassionate, enthusiastic, caring people to join our team. We are looking for people to fill several positions including Licensed Veterinary Technician, Veterinary Assistant, and Kennel Associate. Please call our office today for more info or send us your resume! We are thrilled to announce the addition of Dr. Amy Koenigshof to our team! Dr Amy is a diplomat of the American College of Veterinary Emergency and Critical Care. Check out of staff page for more info! 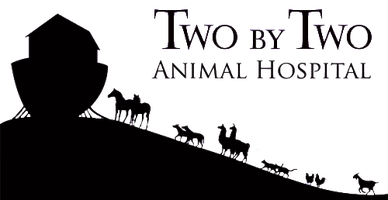 Two by Two Animal Hospital closes one Thursday each month from 12 pm to 2 pm to have a team meeting. Our answering machine is changed to reflect this and there are signs posted on each door. We are grateful for all your wonderful referrals! If someone new mentions your name when booking their first appointment, you can expect a small token of appreciation from us (on your account) as a thank you for your trust and friendship.